Some good friends of ours, Alison and Wendong, came down from Beijing to have dinner with us. They brought these beautiful lilies with them. I’ve never seen such long-stemmed lilies! All of the flowers and buds are on 2 stems! The biggest flower is already about 6 inches across, and it isn’t even opened fully yet. I thought they looked pretty in our bamboo vase, so I thought I’d share. Happy Easter! oh goodness! those are gorgeous! 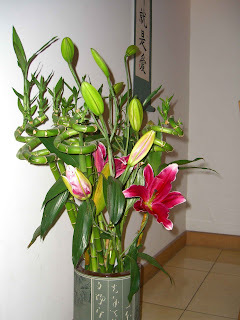 I love the flowers with the bamboo! What a great combo…who knew?! Oh, I look forward to seeing you!